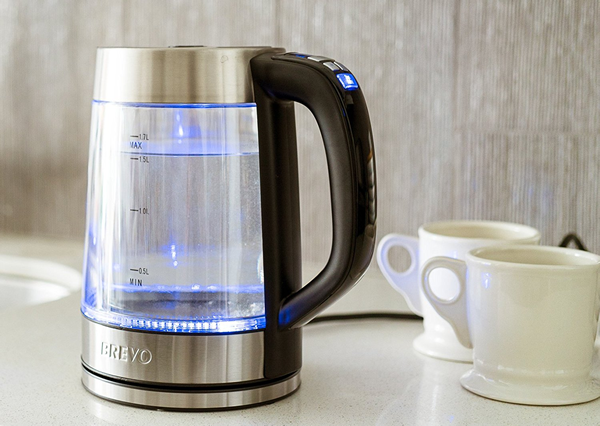 Besides the traditional materials to produce a kettle like metal or plastic, there are others like ceramic (W&E kettle, click here for review) and – glass. It is quite surprising that glass kettles only appeared a few years back. Water attracts attention. People pay good money to watch the ocean, a bend in a river or a beautiful lake. Why not a boiling kettle? 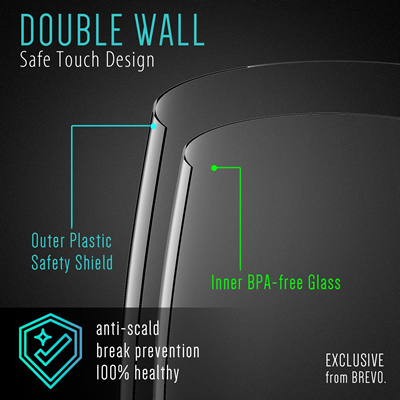 Technically the outside of the double wall is plastic while the inside is a glass-plastic blend. This construction allows a cool exterior and a hot inside layer. The temperature setting is worth having a closer look. Most kettles have preset temperatures to choose from. Not so the Brevo kettle. You can select any temperature between 120°F/49°C and 212°F/100°C in 1°F increments. Excellent for tea lovers and temperature fanatics. If you fill the kettle to its 1.7l capacity, it would take about 6 minutes to bring the water to boil. There is a tame beep, and the light turns off. 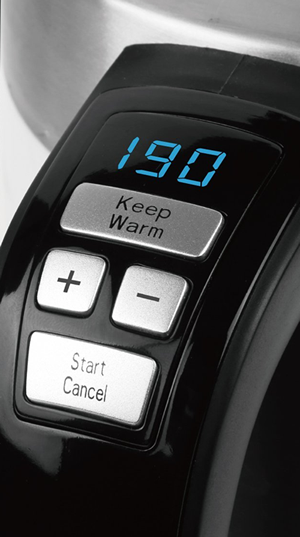 To set the desired temperature, press the + or – button. Keep pushing the buttons, and the temperature will change in 10°F instead of 1°F increments to speed up the process. The kettle does not remember previous settings and will always start with the default 212°F/100°C. A cool feature is the real-time display of the changing temperature while you heat the water. There is also a Keep-Warm button you can press to preserve the current temperature. The Brevo kettle is good to handle but slightly on the heavy side (4lbs/1.8kg, filled 7.7lbs/3.5kg). Like many other kettles, the lid opens by pressing a button on the top. There have been reports complaining about erratic or failing lids. 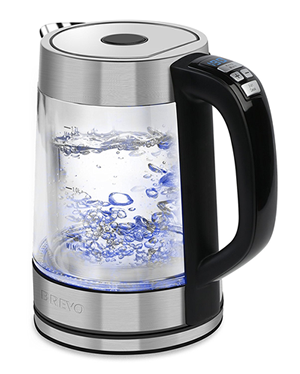 Of all the reviewed kettles the Brevo has the widest range and the most precise temperature adjustment. This makes it ideal for tea/coffee gourmets. The glass design is down to personal preference but a nice feature. You could invite neighbors and friends for a cup of good tea and some water-in-kettle-boiling-watching. 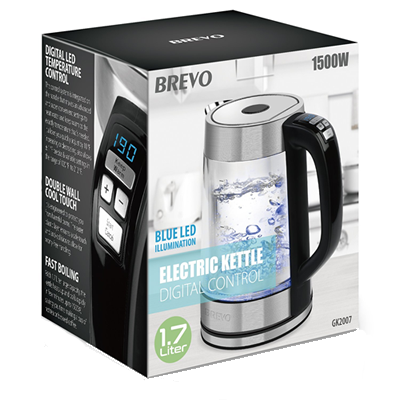 Given the features, the price for the Brevo kettle is fair and justified. To go to the manufacturer’s website: unfortunately they don’t have one!? The Brevo looks amazing. It's a stunning design, from reviews it is well crafted and the temperature range allows it to make a perfect cup of tea or even a coffee consumers dream cup. You did a great job covering features and the price is very reasonable. I have bookmarked your page as I will likely upgrade when my kettle goes out. Thanks for a great review. Thank you Andy. It is very therapeutic to watch the water boiling in the kettle. Makes a good cup of tea too. Once you have a Brevo you wonder how you ever got by without it.